Lachlan Watson for The Spectrum Apparel. 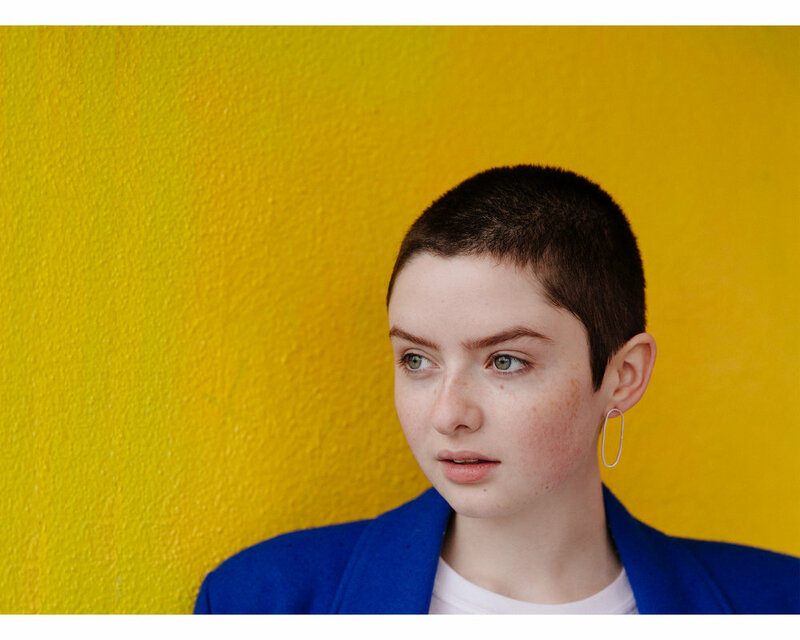 Lachlan Watson is currently making media waves as Susie, an ambiguously LGBTQ+’ character who has been reshaped and rewritten into a major plot point in the new Netflix show, the The Chilling Adventures of Sabrina. Lachlan is undeniably one of the most unexpected delights of the smash success of The Chilling Adventures of Sabrina, which exploded onto the scene in mid-October and is already pumping out three more seasons and a Winter Solstice special. Lachlan, who is nonbinary, and uses the singular they/them pronouns, is humble, charming, dazzlingly funny, and leaves me confident they’re going to help change the way queer characters are represented in media. Spectrum was able to spend the day with Lachlan in Seattle, when they came down for an interview and photo shoot, and that time together confirmed our adoration for them is justified. Driven, passionate, funny, a changemaker, a queer icon, a fashionista, Lachlan is a major force we will be hearing about for years to come. Truly, they are going to impact the world in a big way, whatever they are doing, and we’re happy to be along for the ride. 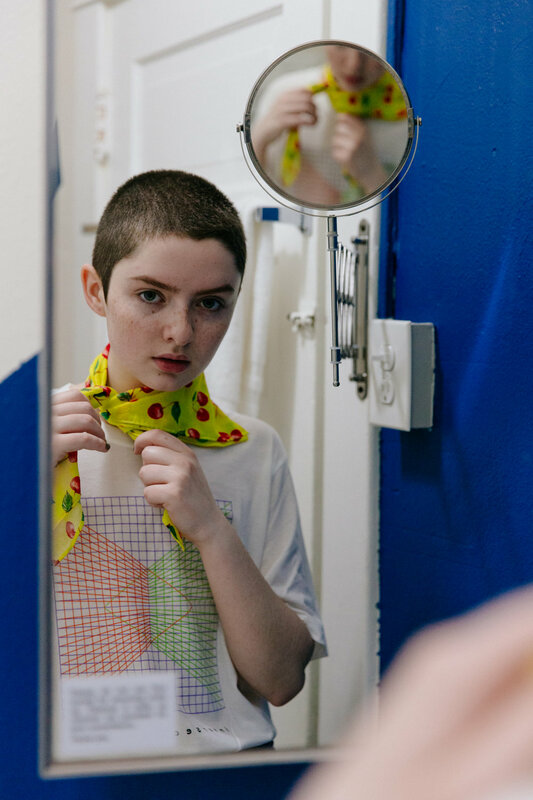 The first thing I noticed about Lachlan Watson was the confidence they exuded, a dazzling sense of self that pushes forward through the screens of social media and fills a room even when they aren’t in it. A confidence that moves its way into the outfits they wear and the way they speak and write; there is an eloquence that comes with the knowledge of who they are. My favorite thing about Lachlan, however, is their laugh because it glows and shines as brightly as they do. I first reached out to Lachlan after seeing them in The Chilling Adventures of Sabrina ( CAOS), playing a character named Susie who started the season being assaulted by the football players at her school in order to see ‘if she was a boy or a girl.’ This scene was raw and relatable and although it’s a disheartening reality, it’s one that many queer people, especially people who violate stereotypical gender norms in one way or another, experience too often and a reality that media loves to glaze over or simply pretend doesn’t exist. As volatile as it was, watching that scene made me feel less alone in my own identity (as that kind of verbal or even physical assault about my own gender presentation is something I’ve experienced), and I followed Susie’s character with a vigorous affinity for the rest of the season, eagerly chasing after plot points. After finishing the show in a humiliatingly short period of time, I began my post-binging ritual of digging through the social media accounts of the show and my favorite characters. It’s common in Hollywood to cast non-queer people as queer characters, and I expected Lachlan Watson to be some sort of a refraction of the character they played on the show, or maybe I didn’t quite know what to expect, but, either way, I was shocked to see who they were in real life. Their Instagram is like a window into the type of confident-being many people would love to embody: Lachlan looking fabulous in a mustard-yellow beret, Lachlan modeling, Lachlan being their adorable self. I was stoked. Trying to find real-life queer representation in the entertainment industry is like trying to find a needle in a haystack. I reached out to Lachlan, told them about Spectrum, our appreciation for them as an actor, and how I’d love to talk. I offered an email conversation, or a Skype call - after all, they were still actively filming CAOS, and a busy, important person. When Lachlan offered to come down to Seattle and do an in-person interview, I felt my heart drop to my stomach and I said “yes” without a moment’s hesitation. So that led to me, standing at the door at my favorite Seattle breakfast spot, waiting for Lachlan to arrive, fidgeting with every element of my outfit that could be fidgeted with. We had been talking in the weeks leading up to their arrival and I felt I was beginning to understand who they were: passionate, sharply funny, eloquent, with a healthy dose of Southern charm (Lachlan lives in North Carolina) and the perfect complement of West-Coast wokeness. I was so lost inside my own mind, debating how I would act when I saw them (do I hug them? shake their hand? give a curtsy?) that I was almost surprised when I looked up and saw them. I started to stutter, what kind of greeting is appropriate? But they grabbed me and wrapped me up in an enthusiastic hug, both of us laughing wildly. “Oh, my God,” I exclaimed. “I feel like I’m meeting my Internet best friend in person for the first time!” “Me, too,” Lachlan laughed, and for the first, but certainly not the last, time that day, I noticed the way they seemed to emanate a warm, wonderful light whenever they laughed. Lachlan Watson for The Spectrum Apparel. GET THE LOOK: Wear Something Gay. After breakfast, Lachlan and I went back to their rented apartment, which was to be our home base for the photo and video shoots scheduled to unfold over the day. The apartment was enchanting; a studio apartment in a building with a creaky staircase, peeling white paint, and a sweeping view of downtown and the Space Needle. “Isn’t it charming?” Lachlan asked, guiding me up to the fourth floor, stopping to admire the view on every landing. “Seattle is the best.” I had to agree. Seeing them fall in love with Seattle made me appreciate the city even more. There was something special about watching the clouds build and boil, high over the city and the water, and seeing them watch it with awe and enthusiasm. There is a genuine wonder in the way Lachlan sees the world and their perspective seemed to spread into the way I was seeing the city, too. The apartment setting ended up being so much more than just a jumping-off point; it almost completely inspired the way the shoot unfolded, with its expansive natural light and homey feel. Under the creative direction of our brilliant photographer, Tywen Kelly, Lachlan jumped on the bed, Lachlan leaned over the stairway banister, Lachlan sat by the window, Lachlan posed against a random mattress that sat in the hallway like an awkward houseguest, unsure if they can come in. The shoot was fun, goofy, natural. Everything that a photo shoot typically is not. “So, tell me a little bit more about your exploration and your journey with queerness,” I asked. “Well,” they started, “it’s funny. It actually came in three cycles for me because, you know, the first part was definitely exploring myself and understanding what it meant to be queer at the time, and understanding the concept of ‘queerness.’ I needed to wrap my head around that before I could wrap my head around the way queerness relates to me, and more importantly, how I related to queerness.” Watching Lachlan talk, I could feel a deep sense of appreciation for them and the way they speak about this topic. It was so cool to see them and get to know them, first as this fun, goofy person laughing and lighting up the room with their presence, and then to ask questions like this and hear them have such a deep and wise understanding of identity, themselves, and what it means to be queer. The Spectrum Spotlight is a recurring artist interview series, highlighting different LGBTQ+ artists and influencers about their work, their inspirations, and their life in general. Know a queer creator, artist or awesome human who’d be a good fit for the Spectrum Spotlight project? Email thespectrumapparel@gmail.com or ameliacovertzeve@gmail.com with your suggestion. Written by Amelia Zeve, blog editor for The Spectrum Apparel.